One, two, zip. You're out the door in seconds and all dolled up in a stylish way. 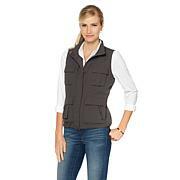 This jacket gives you plenty of range and versatility season after season. Love this Rhonda Sheer zip front hoodie. Would love in gray, navy and white. Great style and fit. Looks great even without any layers underneath. Please made more colors soon. Tip for sizing-click on details see % of spandex, if low then the part 3-4 inches and then go to designer size chart with your bust measure and add the inches. If spandex is high % go up two sizes. I wear 1X in real world but in this I wear a L. I wear this with camisoles and I feel trendy with the bows. Fits good. Soft fabric. Fun to wear. Would recommend it to anyone. I love everything about it. The fit, the tie on the sleeves, and it goes with everything. This material is so thin it should be used as a shell not a jacket. Like most of women's fashion the sleeves are not full length.